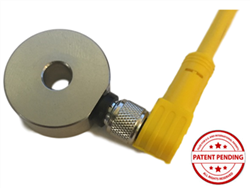 CMCP200ET Mounting Pad with Electronic Temperature Reliability Direct, Inc. Your Direct Source for Reliability, Maintenance, Test & Measurement! The CMCP200ET Electronic Temperature Mounting Pads are designed to make it easy to add a Temperature measurement to your existing Accelerometer installation. They can be used for both new installations and retrofit. They have a center clearance hole for ¼”x28 UNF so that the cable exit can be in the best possible location. For standalone temperature monitoring prepare the surface area as you would for an accelerometer and epoxy or bolt pad to the bearing surface. For accelerometer installation use a 1” long ¼”x28 UNF Stud and the Accelerometer will act as the nut.